Also, I cannot view text with regular browser appearance using Mozilla browsers Iceape and Iceweasel (it appears as white text on white background). It works fine in Web/Epiphany though (which is probably what I will use to access this site at the moment). Could send images of the error? I just set colors to be white text on black. There is no greasemonkey script running on this website. This appears to be the result of a custom (dark) GTK theme. 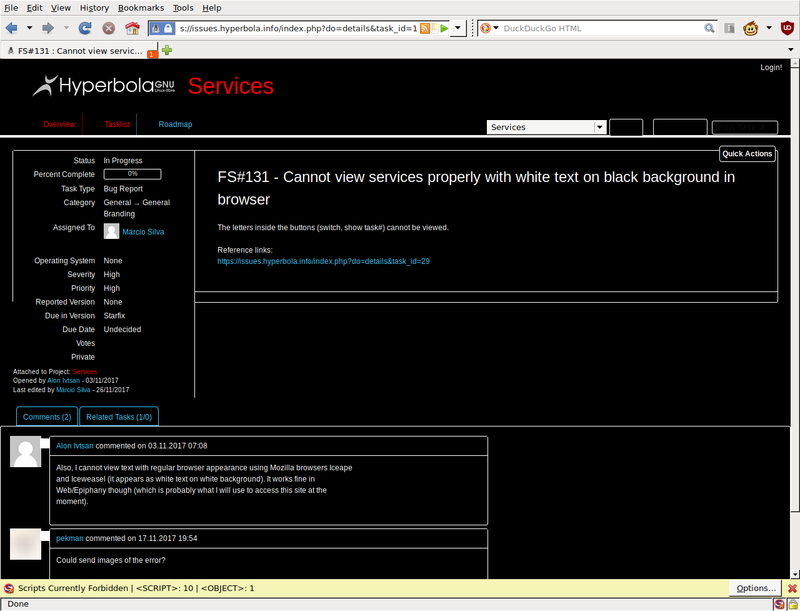 In about:config, set "browser.display.use_system_colors" to "false". I you'd like a custom dark theme for our site, you can use Stylish + CSS to create it, but dark themes are not supported by us. This would affect many other websites as well. Closing invalid as it is a user misconfiguration which is not related to our website.